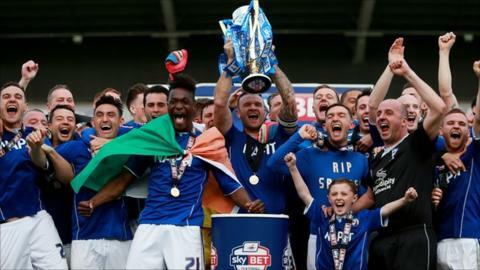 Chesterfield staged a second-half fight-back to clinch the League Two title with victory over Fleetwood. Matty Blair fired the visitors ahead with a low shot but the hosts turned it around with two quick-fire goals. First Sam Hird headed Jay O'Shea's cross in from eight yards out and then Gary Roberts curled a left-foot shot past keeper Chris Maxwell soon after. Chesterfield could have scored more goals before the final whistle sparked off wild celebrations. "The whole day was set up for us to do something good. At half time you are obviously not happy, but in the second half we did really well. "Football is all about the players, and it always will be. I can stand here today and take all the plaudits like I'm a top manager, a good manager, but I'm very lucky to have good players here. "I'd thank everyone because football management is tough, and days like today are very, very good. "I'm proud of the whole club in general." Match ends, Chesterfield 2, Fleetwood Town 1. Second Half ends, Chesterfield 2, Fleetwood Town 1. Ryan Cresswell (Fleetwood Town) is shown the yellow card. Ian Evatt (Chesterfield) wins a free kick in the attacking half. Foul by Ryan Cresswell (Fleetwood Town). Jay O'Shea (Chesterfield) is shown the yellow card. Corner, Chesterfield. Conceded by Liam Hogan. Attempt missed. Dan Gardner (Chesterfield) right footed shot from the right side of the box misses to the right. Corner, Fleetwood Town. Conceded by Jay O'Shea. Foul by Jimmy Ryan (Chesterfield). Gareth Evans (Fleetwood Town) wins a free kick in the defensive half. Substitution, Chesterfield. Sam Togwell replaces Gary Roberts. Dan Gardner (Chesterfield) wins a free kick on the right wing. Foul by Matty Hughes (Fleetwood Town). Corner, Chesterfield. Conceded by Ryan Cresswell. Attempt missed. Gary Roberts (Chesterfield) right footed shot from outside the box is just a bit too high. Substitution, Chesterfield. Marc Richards replaces Eoin Doyle. Foul by Tendayi Darikwa (Chesterfield). Attempt missed. Jay O'Shea (Chesterfield) right footed shot from outside the box is too high from a direct free kick. Ritchie Humphreys (Chesterfield) wins a free kick in the defensive half. Foul by Matty Blair (Fleetwood Town). Attempt missed. Steven Schumacher (Fleetwood Town) right footed shot from more than 40 yards on the right wing is too high from a direct free kick. Matty Blair (Fleetwood Town) wins a free kick in the defensive half. Substitution, Fleetwood Town. Matty Hughes replaces Josh Morris. Jimmy Ryan (Chesterfield) wins a free kick in the defensive half. Foul by Stewart Murdoch (Fleetwood Town). Attempt saved. Liam Hogan (Fleetwood Town) right footed shot from outside the box is saved in the top centre of the goal. Gary Roberts (Chesterfield) wins a free kick in the defensive half. Foul by Josh Morris (Fleetwood Town). Foul by Dan Gardner (Chesterfield). Jon Parkin (Fleetwood Town) wins a free kick on the left wing. Stephen Jordan (Fleetwood Town) is shown the yellow card. Foul by Stephen Jordan (Fleetwood Town). Substitution, Chesterfield. Dan Gardner replaces Drew Talbot. Goal! Chesterfield 2, Fleetwood Town 1. Gary Roberts (Chesterfield) left footed shot from the right side of the box to the top left corner.